Thinking of starting a new blog? Have you considered both the pros and cons of blogging? Want to know what it takes to actually be a successful blogger? Starting a new blog it’s really easy, in fact if you follow me through this article, there are some easy tips how to actually start it step by step. But making your blog a success, well that is a larger task and something that I continue to work on myself. Although I don’t have a huge amount of followers I still consider myself a successful blogger. Because in my opinion, being successful is doing something that you love, something that you are proud of and something you would do even for free. If you want to be a successful blogger and make it a career, then I suggest you start by considering reasons why you shouldn’t. You shouldn’t start a successful blog if you don’t have patience. To get your blog out there and actually get a decent amount of daily readers takes a lot of time and persistence. Most bloggers quit after the first 2 months, I also did 3 years ago. I had another blog and when it initially didn’t work as well as I expected I gave up. Biggest mistake ever! 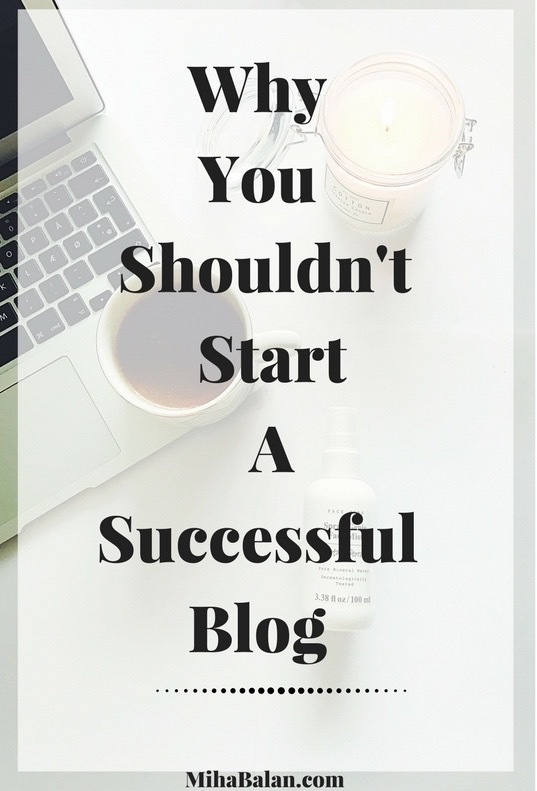 You shouldn’t start a successful blog if you don’t have a basic idea about what are you going to write about. I think that in the beginning it’s okay to experiment with topics, trying to see what readers are most interested in, but most importantly figure out what you enjoy writing about. So make a list of things you would like to write about and things you won’t. It’s really all about discovering what you enjoy the most. Maybe it’s beauty products, maybe it’s outfit inspiration or tips and advice on a topic that you love. What is the message readers should get from your blog? You shouldn’t start a successful blog if you are not ready for hard work. Behind each picture or post that you see from a good blogger lays hours and hours of hard work. By hard work I mean writing good content, making sure you post it at the right time, making sure you promote it, have a great picture for it, answer comments, always being active and much more. You shouldn’t start a successful blog if you can’t commit to it. Everyone can start a blog, these days it’s very easy, you can sign up to Bluehost, pick a name and there you go, you’re set to go. But if you start a blog and post once every two weeks or once a month without committing to it and making sure you keep some sort of consistency then you cannot expect great results – but it can still be a fun hobby. You shouldn’t start a successful blog if you don’t have an eye for photography or graphic design skills (or know someone who has), but don’t worry, you don’t have to be an expert and it’s easy to learn. When people say “a picture is worth a thousands words” in this case, having a good picture for your post can be worth 1000 views. Yes, is that important! If you are going to make Flatlays, Paula from thirtheenthougts has lots of articles where she explains how to take proper flatlay, lights and more. If you are going to make graphic designs then the easiest and simplest is to use Canva.com. You shouldn’t start a successful blog if you think that brands are just gonna jump at working with you and send you lots of free goodies. Those free goodies are not actually free after you put in the work for a post. However, this is a subject I will like to open more in one of my next articles. You shouldn’t start a successful blog if you don’t want to invest in it, with either time or money. No matter if this is as hobby or part time job, you cannot always promote your old clothes or your old beauty products. Sometimes the best is to invest a little bit in order to gain some. I can’t promise the gains will be fast but in the long term it might be worth it. The way you present yourself is really important and you should do it right from the beginning. Your blog is your resume, so why should they “hire” you? If you don’t have a job on the side in the beginning then don’t expect big cash for the first months. Just be prepared, that’s all I am saying. You shouldn’t start a successful blog if you don’t have a good platform to host it on. Bluehost HERE is an extremely easy way to get started. You don’t need any technical experience to use them, the blog software is installed with one click and you even get a free domain name when you sign up so your blog can get a great address and easily be found. The prices start at just $3.95 a month for the basic plan and I suggest you go with or the plus plan for most new sites. Although blogging is not as easy as it looks it’s not impossible either. When you look at the big bloggers who succeed then remember that you can do it too. So, In the end I think that you should start your own blog because it’s an amazing hobby or perhaps even job to have, and something that can open you up to so many possibilities in life. Are you ready to start your own blog? So, if you are ready this is how you get started in six easy steps. Blogging with Bluehost is extremely simple, there are just a few choices to make, so let me guide you through them. Go to bluehost.com and click the get started now button. Use this link to sign up and you’ll also get a FREE domain name. Next you will be presented with a choice of 3 plans: basic, plus and prime. Basic should be enough for just about all new blogs, it’s also the cheapest so I recommend you pick that one. Now this is important. The domain name is the address to your blog and the name that the world will know you by. Pick something good and don’t be afraid to pick something other than a .com domain to get the one you really want. 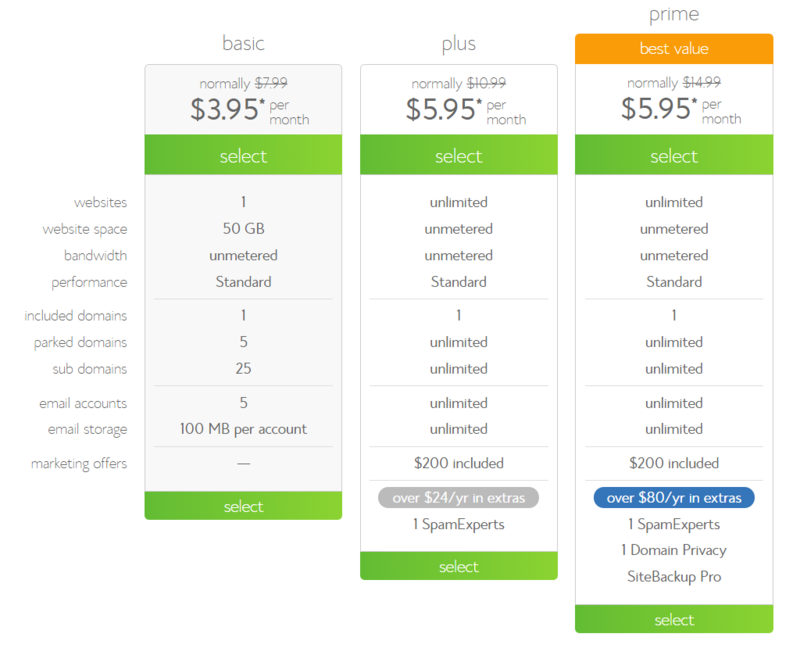 If you already own a domain name from somewhere else, pick the second choice to have it moved to bluehost. domain privacy: choose this to hide your private information (name and address), it’ll reduce the number of unsolicited mails and calls you will receive. Tick this option if you want to stay as anonymous as possible, else leave it off to save a bit. site backup pro: this will allow you to restore if you mess something up and I will definately recommend that you consider it, but you may want to hold off on it until your blog is established and you have some content to backup, save the money in the meantime. This one is easy. Fill in your contact and payment details and that is it. Sign in to your new account and install your blogging software, it really is just a 1 click operation from the control panel on bluehost. I suggest you choose wordpress. It’s easy to get started with and has lots of options for different themes so you can customize your blog to look exactly as you want. This post contains affiliate links but the opinions and recommendations are my own. Thank you for visiting my website and make sure to stay in touch with me through my social media accounts: Instagram Pinterest Facebook Twitter.